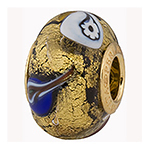 Our popular PERLAVITA line now in the very fashionable SOLE styles named for the way the gold peeks out from the Murano Glass colors. The gold is exterior and can rub off over time and exposure to oils. The insert is Vermeil, 24kt gold plate over .925 sterling silver. The hole size is approximately 4.7mm and will go over the popular bracelets such as Pandora, Chamilia, Troll, Biagi and other chains. 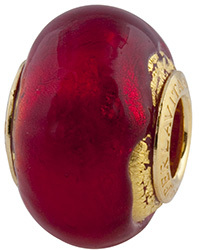 Colors of this one are a base of Red Ruby the gold foil which give it a very rich tone.